Checks may be mailed to: WV VOAD Disaster Relief Fund, 815 Alderson St., Williamson, WV 25661. Donations of cleaning supplies, water, etc. – refer them to the Southern WV Deployment Center, which is a warehouse that collects/distributes stuff for disasters. The 2 contacts they would call is Raymond Stonestreet at 304-590-2847 or Dan Lowther at 304-642-0897. Ryan’s Auto Repair and Ryan’s Recker Service in Belington, the Belington Volunteer Fire Department and members of the Barbour County Commission are taking donations of nonperishable food items, bottled water, health and sanitary items and baby diapers at Ryan’s Recker Service. They will be delivering the donations to Webster Springs at the beginning of next week. This station will be operational from 9am – 9pm effective immediately and until further notice. ITEMS IN NEED: nonperishable food items; bottled water; new or lightly worn men’s, women’s, children’s and baby clothing; men’s, women’s and children’s underwear and socks; diapers; toiletries; pet care products/food; washcloths and towels; hand sanitizer; baby wipes; first aid kits; garbage bags; cleaning supplies; rubber gloves; laundry detergent; flashlights; batteries; blankets and pillows; feminine products. They welcome volunteers to help out with the sorting, packing and loading process. The City of Huntington and the Ohio Valley Environmental Coalition (OVEC) have established drop-off locations for supplies that will be distributed to flood victims in West Virginia. Collected through Thursday, June 30. OVEC will be working with other groups across the state to coordinate how the items will be best distributed after pick-up. OVEC is seeking volunteers can offer to help load supplies on Thursday and provide transportation. For more information or to offer assistance, email Natalie@ohvec.org. Kindred Communications and The Dawg will collect flood-relief items at the Pullman Square Summer Concert Series on Thursday, June 30. Ansted Baptist Church – Food and towels are needed. Oak Hill – Sue Ann’s Consignment on Kelly Ave. Donations of food, clothing, baby wipes and diapers. – The Bridgeport Fire Department on West Main Street will be accepting donations. They’re requesting water, nonperishable food, cleanup kits, bleach, brooms and maps. – The Shinnston Volunteer Fire Department, the Lumberport Volunteer Fire Department and the Spelter Volunteer Fire Department will be accepting donations. They are requesting bottled or jugged water, nonperishable food items and cleaning supplies, such as hand soap and laundry detergent. If no one is present at the fire department, supplies can be dropped off outside. – The Stonewood Volunteer Fire Department is collecting items. They’re requesting cleaning supplies, especially bleach, baby wipes, diapers, baby food and formula, toiletries, work gloves, toilet paper, feminine hygiene items, shampoo, toothpaste/toothbrushes, batteries, buckets, garbage bags, face masks and bottled water. Donations will be accepted at Sacred Heart Roman Catholic Church in Charleston Saturday from 12 p.m. until 4 p.m. The drive will benefit the Nicholas County Community Foundation. Items being collected include water, cleaning supplies, baby wipes, diapers, baby food, baby formula, non-perishable food, work gloves, clothes (clean and lightly used), garbage bags, flashlights, batteries, first aid kits, monetary donations as well as blankets, pillows, and donated clothes for the nursing home. Sam’s Uptown Cafe, Sam’s Uptown Lounge and The Boulevard Tavern in Charleston are accepting flood relief donations and supplies. – Fairmont Regional Medical Center will accept donations in the emergency room. They’re requesting bottled water, cleaning supplies, bleach, baby diapers and baby wipes. – Fritz’s Rugratz Daycare in White Hall will take donations from 6-8 p.m. Friday night, 8 a.m. to 4 p.m. Saturday, and 8 a.m. to 2 p.m. Sunday. Volunteers to help load trucks on Saturday and Sunday are requested, as well. They’re requesting bottled water, cleaning supplies and toiletries. – Mario’s Fishbowl will accept donations Saturday from noon to 5 p.m. They’re requesting water, nonperishable food items, hygiene items, clothing and socks. – The West Virginia Black Bears will team up with the United Way and American Red Cross and accept donations during their home series at the Monongalia County Ballpark this weekend at Gates A & C in yellow bins. They will also continue to take donations during next weekend’s series, as well. The United Way is requesting cleaning supplies, especially bleach, baby wipes, diapers, baby food and formula, toiletries, work gloves, toilet paper, feminine hygiene items, shampoo and toothpaste/toothbrushes. All monetary donations will go to the American Red Cross. You can also donate by visiting redcrosswv.org. – United Talent Staffing in Morgantown will take donations at their location on Holland Avenue. They’re requesting bottled water, canned goods, clothes for people of all ages, nonperishable food, hygiene products, cleaning products, dog and cat food and blankets. – The West Virginia University football program will be collecting water and canned or nonperishable goods on Saturday from 11 a.m. to 6 p.m. A truck will be located in the Milan Puskar Stadium parking lot. Padrino’s Italian Restaurant in Beaver. State Farm at 106 Sunset Drive in Beckley, just off of Harper Road, across from Advance Auto Parts will serve as a drop-off and distribution point for emergency supplies for flood victims. 1st Action Bail Bonds at 208 N. Fayette Street in Beckley is accepting blankets. Mountain State Centers for Independent Living on Prince Street will be accepting water and cleaning supplies. Items can be dropped off between 9 a.m. and 5 p.m. Monday through Friday. Mountaineer Automotive will be collecting donations during normal business hours at the Ford-Lincoln showroom and the Mitsubishi showroom at 615 N. Eisenhower Drive in Beckley. The showrooms will be open until 8 p.m. Friday, from 9 a.m. to 8 p.m. Saturday and from 1 p.m. until 5 p.m. Sunday. Erma Byrd Center will be accepting and “starting over items” from boys and toys to kitchen and cleaning supplies from 8 a.m. to 8 p.m. Monday through Friday. All Gino’s and Tudor’s Biscuit World locations are accepting donations for flood victims, including cleaning supplies, dry or canned foods, water and pet food. The Grandview Subway is now accepting donations. – Goody’s in Buckhannon will be accepting donations, and in return, they’ll give you a $10 coupon to use in the store. – The Smithfield community in Wetzel County will be taking donations at their community building on Mannington Road. They will accept donations until 9 p.m. Friday and all day Saturday. 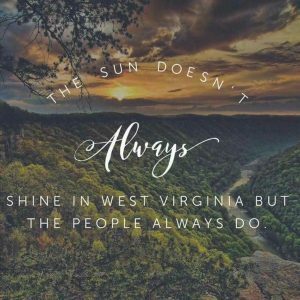 The best place to find anything flood relief related is at wvflood.com. They should have details on all of the drop off locations and exactly what each area needs. Where in Jefferson County can I donate clothing for the flood victims? The best place to find answers to anything flood related is wvflood.com. They have become the hub for all resources.